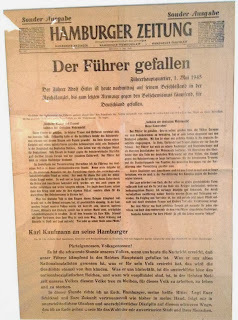 This was interesting in the museum - this is a special edition of the Hamburg Zeitung (newspaper 1May1945) announcing that Der Fuerher (Hitler) has fallen. 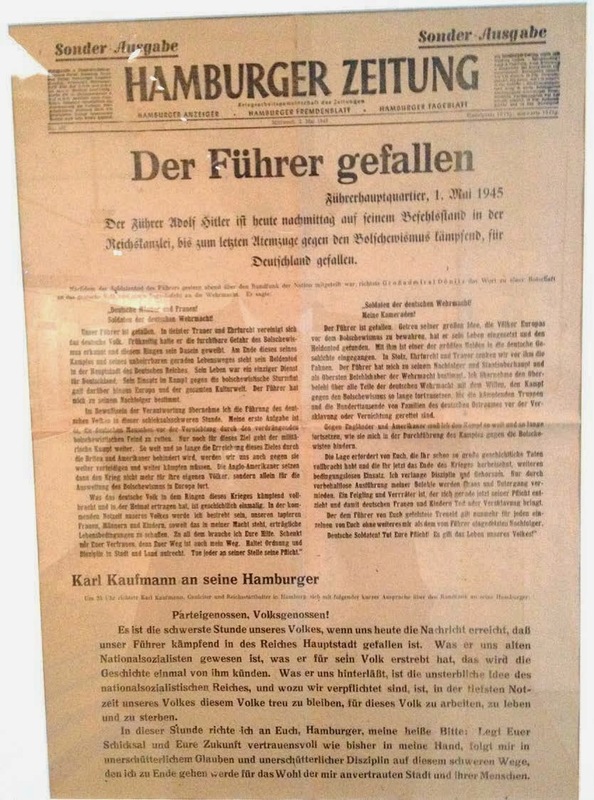 The story line is that he died, bravely fighting the Bolsheviks and at the helm in the Reich's Chancellery. Not exactly the way I was taught history or the historical reports and special programs that have been shown. This is a bell from one of the ships, but I don't know which one. Not the Bismarck, as that one was sunk and I don't think the bell was recovered, but I'm only guessing on that one. U-Boats played a large role in WWII, but also were being used a great deal in WWI. This pic is of a WWII vintage U-Boot (German spelling) for Underwater Boat. The Germans did not have a mega U-Boot as has been located recently in the Pacific that the Japanese made during that period of WWII. The "Con" - conning tower. Here is a Destroyer that was commission in the German Navy in the mid-1960's. It was deployed in the Mediterranean Sea during the Iraq/Iran War as a part of NATO activities in the Middle East. It served for many years, but I don't have the date it was decommissioned or put on display as part of the museum here in WHV. It was likely in the late 90's or even early 2000-x. It also had a guided missle capability as you can see from other pics below. NOPE - This is not the guided missle. Close - but this one goes with intent and focus that is not remotely computer guided. The Captain's quarters are right nearby and they were very nice as opposed to other areas of the ship. The alleyway to the Captain's quarters and bridge area was labeled: Koennigsalle" or King's Alley. One of the many rooms in the shjip. Close quarters for the sailors, but there was a section that I felt it would take midgets to be able to get into and beds were -high in that section. This is the Noncommissioned section. This is one of the 'break' areas for the sailors and Non-Coms. It would take a special person who doesn't mind close living conditions to be able to go to sea for weeks/months at a time and not go nuts. The submarine was much worse for space. BUT - EVERYBODY has be aware of hygiene. Here is the washing machine. It is quite large, but I would have anticipated more than one would have been necessary to handle the volume that would be created on a ship such as this. I also suppose that sea water would have to be used for much of the action in order to conserve drinking water - again, I'm just guessing, as I don't know what kind of technology would have been available to the ship when new, or with subsequent updates and refurbishings. Dry cleaning was likely not available, but again ????????? STORMY WEATHER over the week and weekend. We had a very windy week end here in WHV. Will put in a couple of pics we took up on the North Sea Coast. The WIND was really blowing and the rain was a little icy - it really stung when it hit us in the face. That put us in a position to only point the cameras in one basic direction - with our backs to the wind!!! Winds were going about 120-160 Km/hr or about 70-100 mi/hr. This is NOT high tide - that came later and Hamburg had some flooding, but WHV only had trees blown down and power outages. Kind of boring isn't it - Ok I'll move on. You can rent a room cheap right now. This little place will be humming with people as June rolls around. We will get some pics then for contrast - they will be the ones who have sense enough to avoid the bad weather. OH - that's me on the right - I kept my new hat on!!!! BUT IT WAS TIGHT DOWN ON MY HEAD. It looks cold! And those ships must have smelled off some major BO too! Did you know there were U boats in the Gulf during WWII? I didn't know that until a couple years ago. Loving all the pictures and the commentary.